GALION –Highland assured themselves of sole possession of their fourth straight Blue Division title in volleyball on Thursday when they traveled to Northmor and claimed a 25-17, 25-17, 25-15 win over the Knights. Head coach Rob Terrill noted that, despite the scores, the win was anything but easy. Northmor’s defense was what made things tough for the Scots, as Highland wasn’t able to go on lengthy runs in the match, instead having to grind out points. Northmor coach Kara Wright noted that the challenge was simply maintaining consistency from point to point against the Scots. In the first game, the Scots opened up a lead after three straight points by Bridget Oder moved the score from 12-7 to 15-7. With the score 18-11, Northmor got three points from Anna Donner to close within four, but a defensive stop followed by three Parker Steck points gave Highland a big lead again on their way to taking a 25-17 win. It took a while for either team to grab momentum in the second game. Trailing 8-6, the Knights were able to move in front behind three points from Lindsey Wiseman. However, their 9-8 advantage would be short-lived, as they would only score one more offensive point in the game. Meanwhile, Highland got one from Bailey Santo, two from Oder, one from Ashton Terrill and five from Krista Walters to surge in front 22-13 on their way to taking a second straight 25-17 win. The third game started out as another dogfight. Despite Oder scoring three early points, Northmor was able to stake themselves to a 7-5 lead after getting two from Kelsie Fike and one each from Jordyn Zoll and Hope Miracle. Once again, Highland’s defense would prove to be the difference, though, as Northmor only scored one more offensive point in the match. Meanwhile, Highland got 12 during that span. Two from Terrill gave the team an 8-7 lead. One from Walters increased that to a two-point margin and three from Santo would make the score 15-10. Highland would then get two each from Oder, Terrill and Walters to finish off the game and match, moving the Scots to 19-0 overall and 13-0 in the league. With the postseason just around the corner, coach Terrill feels his team’s late-season schedule should help prepare them for the tournament. Ashton Terrill finished with 16 kills and three aces for the Scots, while Gena West had seven blocks and three kills, Steck added seven kills and Raina Terry tallied six kills and four blocks. For the Knights, Zoll had 16 assists, four kills and 15 digs; while Caitlin Thebeault added seven assists, three kills and 14 digs. Fike tallied eight kills, Donner picked up seven more to go with an ace, 15 digs and a block and both Rayanna Loyer and Hope Miracle finished with two kills. Miracle also had an ace, while Lindsey Wiseman finished with 13 digs. Highland also won the JV game. 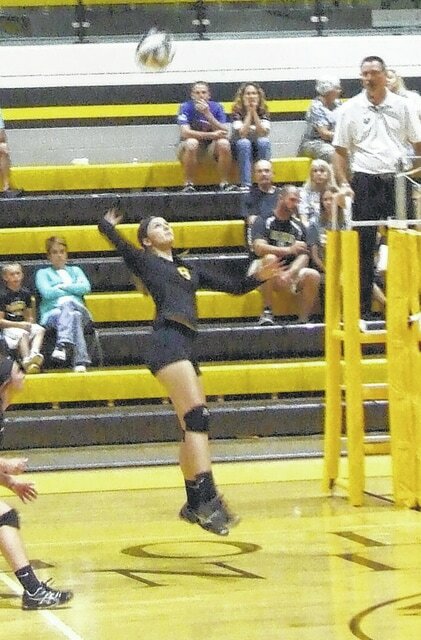 Highland’s Kelsey Walters goes up for a kill against Northmor Thursday. Rayanna Loyer hits the ball for Northmor in her team’s match with Highland.